May God Bless Us and Protect Us. tinklebell, make sure you pay them for their help. I would like to thank God, Mother Mary, St. Expidite, St. Jude, & Dr. Jose Gregorio Hernandez for their help in healing me. You guys I was in sooo much pain, I could barely walk. I had a huge abscess buried underneath my ceserean scar. The pain was unbearable. I placed the cards of St. Expidite, St. Jude, and Dr. Hernandez on my scar and I place Mother Mary on my table next to the bed. Shortly after that, the abscess burst and I felt 100% better! Thank you Lord for that! Thank you Saint Michael, Holy protector and defender, for watching over me and my loved ones in times of trouble. Thank you Saint Gabriel for showing me hope in even the darkest of times. Thank you Saint Raphael for your compassionate healing and wisdom. St. Expedite. thank you for blessing my family i pray you contenue to bless us,thank you saint michael for protecting us and thank you saint martha for keeping the hubby inline and whipping his head strate when he wasn't using the right one .i thank all of the saints for being there gideing us and helping us during tough times in our lives. Thank you St. Expeditus for your help in my court case! Thank you for your swiftness St. Expedite. I am in awe of you and thank you for all your work. Thank you, Virgen Caridad Del Cobre and All Saints. Thank you Saint Lazarus for all your help and I hope you continue to bring those blessings in your a wonderful saint and I am truly thankful for all your help. Thanks Saint Lazarus for all your help. Thank you All Saints. Always thanks to The Father, Son and Holy Ghost. Our Lady, St. Joseph, St. Jude and St. Lucy. Thank you Saint Anne/Saint Anaisa, Saint Alex, Saint Micheal Archangel and Saint Clare for everything you have done for me and my family. Past present and future. Thank you sooo much. Kindly excuse my ignorance everyone! I wonder what is meant by offering gifts to the saints? Do you get a statue of the saint and put the gift in front of it? If so, how long do you leave it there for? And what do you do with it afterwards? That's one way to leave a gift for a saint. Other people donate to charities associated with that saint or spread the word about their goodness and power. How long you leave a gift in front of a statue and what you do with it typically depends on which tradition you follow. If it's flowers or food, I usually leave them there until they start to look un-fresh, then I take them and leave them in nature. But people have their own ways. Read through this thread to learn more. Thanks Sister Jean for the information! Veneration of All Saints is a Catholic tradition that includes not only all of the popular saints associated with holidays and all of the patron saints associated with places, names, and occupations, but also the so-called "minor" saints favoured by those who feel a tie or link to some aspect of their lives, struggles, martyrdoms, and triumphs. 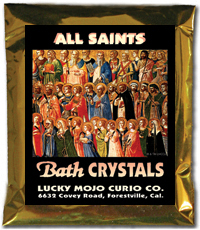 I just ordered all-saints oil couple days ago. Can't wait. Can I use the oil for dressing candles for any saints? 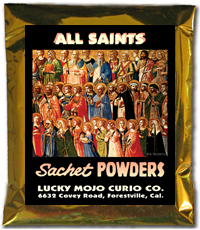 I'd like to get different oil for different saints but I can't afford it right now. Thanks much. 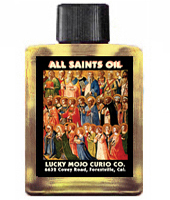 Yes you can use the All Saints oil to petition the pantheon of saints or any one in particular.